Australia retains one of the most coal dependent electricity supplies in the world. How can proponents of renewables and nuclear power respectively get out of our trenches and pull together for the national interest in a responsible path for decarbonisation? Some time ago I wrote for ABC’s Environment Blog that Renewable versus nuclear is the wrong battle. With the review of Australia’s Renewable Energy Target taking up so much air time, it’s important to reflect on how far Australia has come with renewables and decarbonisation and think about where we should go next. Renewables versus nuclear may be the wrong battle, but what might the right one look like? Much of the current commentary on the Renewable Energy Target resembles trench warfare between two fundamentally opposing sides. What we know about trench warfare is it’s a lot easier to spend all day shooting at each other if you have completely de-legitimised the opposing point of view and the evidence supporting it. To this observer and commentator it seems that both the naysayers and boosters of renewable energy each have a lot to answer for. onwards, as demand growth begins to absorb the excess generation capacity. Lower wholesale prices outweigh the direct cost of certificates over the period 2020 to 2030, meaning that retail electricity prices over this period are lower with the RET in place. However, the cumulative impact of the RET on household bills over time appears to be small. The ACIL Allen modelling shows (Figure 18) that repealing the RET would lead to a small increase in electricity prices over the period 2020 to 2030, but prices would remain within 1.5 per cent of current levels. The NPV of the cost of the RET to households is estimated to be $247 over the period 2015 to 2020 and one dollar over the period 2015 to 2030 (Figure 19). Net present value cost of ONE DOLLAR per household over 15 years? So what’s the problem? expense of revenues of incumbent generators. Ah. I think we are getting warmer. The Government needs a strong reminder that the vested interests of incumbent generators are not a proxy for national interest. The fact is whether the naysayers like it or not, Australia is continuing to run effectively with more renewable energy, year on year, every year. Have the incentives driven up electricity costs? Barely. The recent steep rises in electricity costs have been overwhelmingly the result of over-investment in transmission networks that was linked to a regulated rate of return to companies responsible. This needs reform, urgently, and the lack of interest from Government is telling. Distribution network prices are the largest contributing factor to price rises in South Australia, and are primarily driven by the prevailing revenue requirements set by the Australian Energy Regulator in 2010, for the 2010-2015 regulatory period. Is renewable energy bad for consumers? Not yet it isn’t. As two reviews have now established, the low operating costs of wind have depressed wholesale prices overall and so far that has been a net benefit to consumers. With over one million solar systems installed, the whole “rich person’s toy” notion can be put to bed. Australians across the socio-economic spectrum are enjoying lower energy bills thanks to their systems. Is it just too expensive? Wind power is the cheapest source of new electricity in Australia today, when built-on to the existing system. At around $90 MWh-1 with scope to fall further, anyone arguing that this electricity source has no role in our energy future is clearly arguing from ideology, not economics. Solar PV has seen steep price declines. It is a virtual certainty that this will continue. Does it fail to lower greenhouse gas emissions? No. Thanks to the clever operations of our National Electricity Market, coal-fired output is reigned in when wind and solar are producing. Has it made the network unstable? No. The network is strong enough. It has to be to manage the potential unscheduled loss of large generating units from fossil fuels, and every year of experience makes us better at managing variable renewables. So frankly, efforts to kill advances in renewable energy at the present time are nothing to do with national interest, and everything to do with vested interest. Variable renewable energy sources are highly disruptive to the electricity market. Disruption is not inherently bad for the national interest, nor inherently good. The role of Government in free markets is to monitor and understand the disruption that is taking place, and provide supporting infrastructure and systems to maximise national interest. That may mean acting to constrain the disruption, or it may mean acting to allow it to happen with the most benefit. Simply preserving the status quo at all costs, and despite evidence relating to national interest, is poor governance. Just telling Australia “renewables are bad” is beginning to sound exactly as simplistic as it is. It’s time for the renewable energy naysayers to lick a few ideological wounds and come back to the argument with some evidence-based propositions. But then, why should they? When the renewable boosters do the same thing, putting ideology above analysis and national interest, the naysayers are scarcely under pressure to lift their game. So what case do the boosters have to answer? A big one. Is wind cheap? Sure, I have just said so. But only as small additions on a very large and mature system of dispatchable generators. At a higher level of penetration, masses of correlated supply that are uncorrelated with demand will make further additions of wind escalate rapidly in cost and decline rapidly in market value. Looking at that from the other direction, would it be cheap to run Australia only on wind? Of course not. It would be horrifically expensive, were it even possible. So every time a renewable booster says “wind is cheaper than coal” they tell a big lie of omission to the rest of Australia by neglecting to say “as long as coal and gas are there to manage the variability”. These commentators spend much of their time slagging-off the energy sources upon which the successful uptake of wind has depended. Maybe those incumbent generators need a little respect, after all. Does solar power help with peak demand? Barely. Australian peak demand is at 5-6 pm in summer where output from solar systems is well down from the midday peak, and the peak day for a year may well be both very hot and overcast. Winter peak is the same time of the day but, you know, in winter…The network benefit from PV in managing peak demand is modest at best. This is another little lie boosters seem happy to either tell or let fly past them. Are renewables dramatically remaking Australian electricity for the better? Give me a break. In percentage terms we have gone backwards since 1960 for renewables. Wind and solar might now be providing 4-5% nationally on top of a monolithic fossil dependence. Is baseload a myth? Of course it isn’t, and every time a renewable booster/climate activist makes that short-sighted and self-serving argument, stakeholders in government, industry, commerce harden themselves further against taking action in the name of clean energy. Is South Australia 30 % renewable, providing an example to the nation? This is the worst of all because the answer is neither “yes” nor “no”. The answer is that South Australia has accommodated that much wind supply because (a) it is connected to a massively larger market from which to buy and sell and (b) because the other jurisdictions in that market have not built a similar supply. If Victoria had built a similar percentage quantity of wind supply then guess what? South Australian wind would often be correlated with Victorian wind, competing for the same space in the market, and wind would be well on the way to finding its own economic upper-limit. Do renewable boosters help other Australians to understand this? The hell they do. It ruins a good story. I contend that we now have enough empirical evidence and system understanding to plot and plan optimal decarbonisation of Australian electricity using renewables in an efficient way. It is evident that, with good governance, the lower-cost variable renewable sources of wind and solar PV can be deployed in Australia to the benefit of consumers up to a far greater penetration that currently exists in the National Electricity Market. For the sake of argument let’s put that level at 20-25% of total supply, consistent with the bulk of literature on the topic, before the system costs of further penetration begin their rapid escalation. That represents a four-to-five fold increase on current levels. As such it should be viewed as nothing but good news by those industries. Achieving such a level in the next few decades would be boom times. So why, oh why, do the voices of those industries not take that line? They could firmly occupy the middle ground and demonstrate to Australians that they are honest about both the potentials and limitations of their technologies. It is this position, more than any other, that would show-up the ideological naysayers for what they are. I’m going to venture an answer to my rhetorical question. Taking this position requires a firm acknowledgment of the vital nature of a base of fully dispatchable supply upon which to effectively operate the variable supplies. It’s in that segment of the market that renewables fall over in the decarbonisation task and nuclear power rises up. Geothermal in Australia has been written-off, both literally and figuratively, leaving solar thermal with storage to carry the all-renewable hopes. Here though, the economics/national interest case is nowhere in sight. It’s very expensive for a system that does not resemble, in any compelling way, the reliability of fossil fuels without dramatic over-sizing that will drive costs up ever more. It will often be remotely located, even compared to wind power, meaning far more substantial costs in transmission upgrades. It’s far from loads, the complete opposite of rooftop solar PV that lives on top of loads. The cost element of what I have described above has to change a lot before even coming close to what nuclear power can offer right now. It’s inexcusable that we would sit back and wait for it rather than planning decarbonisation based on what we know now. Overhaul the Renewable Energy Target in favour of a Clean Energy Target (CET) that includes nuclear energy. Since modern nuclear energy provides superior capacity and reliability to our old fossil fuels, there is no technical reason this target, including existing hydro, could not be set at 95 % by 2050 from the very outset (allowing for the economic use of peaking gas). Not one single stakeholder could claim concern about reliable supply and predictable pricing. Differentiate the target to provide incentives for (a) quantity of electricity provided and (b) firm capacity added to the network. The lower-marginal cost wind would continue to expand in early stages on payments from (a) with small payments from (b). The higher cost nuclear would enter the market later, getting over the line with strong payments from both (a) and (b). As for the argument that nuclear is “too expensive”, letting it succeed or fail under this type of target would be the best way to test that. Monitor the network and market outcomes with national interest in mind. As and when negative outcomes from variable supply are arising, make regulatory or infrastructure changes to manage that so long as a net-benefit remains. For example, if South Australia remains the friendly home of wind in Australia, so be it: build better interconnection to accommodate that. The long-term value will surely be there as better interconnection aids all players. As the net-benefit of new variable supply diminishes, adjust the CET (as required) to weight payments away from (a) (quantity of electricity) toward (b) (amount of firm capacity). Meanwhile undertake an accelerated program of introduction of nuclear power to Australia. Based on the actions above, first power from nuclear could be generated as we approach near-optimal exploitation of wind and solar PV. With the CET based increasingly on the need for further clean energy to have high firm capacity, investment will solidly shift away from the variable renewables and toward the nuclear, permitting the permanent exit of coal and then gas generation from the market, never to return. Vary our emphasis on solar PV away from electricity supply and toward network management, especially management of peak demand. The coming of cost effective home energy storage should be emphatically embraced as a potential network service. Consumers should be encouraged to take up small amounts of storage and remain grid connected into the future. An appropriate financial reward should be provided for residents to use and sell their solar power late in the day in response to peak times rather than as –and-when it is generated. This will hold down network costs for each and every consumer, instead of raising them as solar PV does now. The “death spiral” of retail electricity will be averted. In 2014 solar eased peak demand in South Australia by an appreciable amount. But it may not do it every time. Just a little storage to dispatch that midday hump over to 5-6 pm would deliver the greatest ratio of benefit to investment in solar. That’s what policy must aim to facilitate. Accelerate the introduction of electric vehicles to the Australian market. The new, large overnight demand will provide greater utilisation of wind, greater utilisation of nuclear, greater utilisation of networks, and greater sales for retailers, improving financial outcomes for nearly all major players. An approach like this calls for national interest to trump all. As I have said that requires good governance. Everyone has a role to play in making the path of good governance as easy and logical as possible for those in power. Since I tend to favour emphasising the responsibility that is closest to home I will close by saying this. Nuclear power supporters who double as renewable energy naysayers need to spend more time reading our better renewable energy commentators (Tristan Edis) principle among them, to continually check their opinions against our evolving evidence and experience with variable renewable energy sources. Demands for evidence-based opinions and policies cut both ways. The way forward for everyone in the clean energy area begins with better mutual understanding and respect. As for the hardened climate change deniers? As I have argued before, we don’t beat them by beating them. We beat them by making them irrelevant. It’s time for all of us to take more responsibility on that front by making adherence to national interest our guiding principle in charting a decarbonisation pathway. Epilogue: If this represents the renewable answer to nuclear, we have to wake up and get moving with sensible policy. It pays to keep an open mind, but not so open our brains fall out. Previous Entry “What can I do?” I have three things for you! – RET lowers wholesale prices allowing for LGC subsidies? Another consultant couldn’t confirm this. It’s saying the private sector needs government intervention to find efficiencies. When you get $40 LGC per MWh you can afford to discount. Would power be even cheaper if the RET was 40%? the capacity upgrade to the Heywood and Murraylands connectors may not be needed when Holden pull the plug. SA will have excess generation albeit high carbon at times. I think SA should be able to cover most peaks using minimal gas and also export some dispatchable power to Vic, not import brown coal power. In theory explicit carbon pricing should help find the least cost combination without the govt playing favourites. I believe dry rock geothermal got $300m of public money for nil result. I’d prefer loan guarantees, contract-for-difference and insurance indemnities rather than LGC type subsidies. It’s like the German model. In theory carbon pricing is great, in practice, well, Australians have some experience in that don’t they? Carbon pricing, such as fee-and-dividend which is the most immune to government, vested interest and the financial sector, is a good marginal abatement policy. It’s a particularly impotent form of energy policy in my opinion. Direct plans for the energy sector are required. Well said Ben. With EU target of 40% GHG reduction on 1990 levels by 2030, Australia will be under a lot of pressure to increase its 5% reduction target (effectively 0.5% reduction on 1990 levels) as soon as possible. Reading your blog since day one you have come a long way in terms of your understanding of the grid. Well done. This article is fantastic and should be the starting point for anyone wishing to begin advocating for a cleaner electricity system. In writing this, I confess, I was pleased with what was coming out. It could not have happened a few years ago. Seems to have hit the spot. Good to see the issue of tribalism being addressed. Group think is such a terrible thing to be caught up in, the endless circle of people patting each others backs. Good work, Ben. Who will be easier to convince? Nuclearists or renewablists? … I’m banking on a healthy population of moderates in both camps? Really interesting piece, Ben. As in so many areas of public policy, this cries out for real understanding and leadership in the national interest from members of the political class. Does anyone see potential for that sort of leadership from anyone now active in politics? Left field comment — this suggests that it is time to ditch the RET. Consider for a minute. The basic argument against zero carbon is not that the earth is or isn’t warming. It is simply that the proposed ‘solutions’ are uneconomic. The simple existence of the RET makes this case for them with no further argument required. If ZC sources are economically competitive, get rid of the training wheels. Nothing more powerful could be done to bring your opposition on side. If you aren’t that certain of the economics of the situation, then argue to have a zero carbon target, rather than a renewable energy target. That’s enough of a change that it might satiate the need for the government to be perceived to be ‘doing something’, and it gets nuclear in the door. With nuclear in the door, they may even be willing to argue for a higher target, because it can be presented as an economically rational decision. It is not cheaper than the electricity from existing, very old, very dirty incumbents which can keep in chugging. Nor would be nuclear. Targets are needed. Volume weighted average wholesale is something like $55/MWh. Hence the RECs earn about $35 each, which is the difference for wind energy to compete. New nuclear would need about $50 per MWh to compete, though as above this could be awarded based on both electricity provided and firm capacity added, as nuclear offers lots of firm capacity and wind offers little. Its the price for new power that sets the market for new capacity. Price for existing capacity is only relevant in terms of replacing that capacity, which will happen eventually anyway. At best the RET will see some plants replaced before they orherwise would, although not necessarily the ones you would choose on a pollution basis. Arguably, swinging the discussion in your favour by the extent that removing the RET would make more difference. Not to get obsequious at all, but this is excellent. The largely successful businesses that import, assemble and/or operate solar or wind generation are part of the equation. If someone hates the look of wind turbines, or doesn’t believe in the impact of fossil combustion, or exclusively supports an alternative technology then that’s up to them but it isn’t a real justification for dismissing the reality of the modern marketplace. Not that I doubt this, but could you link something recent where this is demonstrated Ben? Best discussion was from Tristan Edis with good data and yes, I’ll see if I can track it down. Thanks Ben. He writes good. The cancellation of the 600 MW King Island wind farm made me wonder what happened to the 600 MW Ceres wind farm on Yorke Peninsula SA, coincidentally not far from the Hillside copper mine with subeconomic uranium grades. My guess is that the slimmed down mine will go ahead on YP but not the wind farm due to NIMBYism and RET uncertainty. Both King Island and Ceres proposed underwater HVDC cables to population centres. I believe SA now has 540 MW of PV (cf 16%?) and 1450 MW of wind capacity (cf 30%?) with about 2000 MW of demand in spring weather. Mines like to operate around the clock in all weather. SA needs dispatchable load following power cheaper than gas which could be say $150 plus per Mwh when gas is on export parity price. An EC6 would be good. Also appropriate if it helped power uranium mining. Apart from the necessary 60 km of underwater transmission, it would probably be a good spot for large scale wind. Would it necessitate the awaited SA-Vic interconnect upgrades? Of course, we have professional estimates for the cost of an EC6. So SA needs federal regulatory adjustments and an enthusiastic host community (along with a mass of other work that can’t be denied). But otherwise this would be modern, dispatchable, industry-friendly capacity much closer to the load centre. And more importantly, it would be precedent. I doubt Ceres will go ahead as SA will need guaranteed windpower sales to Victoria to justify it. Recall they were going build a hay burning power station as backup. It looks like Yorke Peninsula is NIMBY central despite the existing Wattle Pt wind farm. I read that Hillside mine is part of the same geological formation (Gawler Craton) as Olympic Dam and several others. To go ahead these mines need power to run machinery or desalinate water, an extra 650 MW in the case of OD. A 700 MW EC6 located somewhere neutral could supply that power. The rising gas price improves the economics but not unlimited supplies of brown coal power at $40 (and 1.35 tCO2) a Mwh. I think this article is excellent, and points towards a way that the supporters of nuclear and renewable can work together. But I must admit to still being confused, so I have to ask: if nuclear is so powerful and reliable, and can provide the baseload power that society needs at about $50 per MWh, then why have renewables at all? Can we not just build the nuclear capacity that can cover peak need? Thanks Michael, and for the question which is a good one. To clarify, the cost of electricity from nuclear in Australia would start at more like $120 MWh. The $50 approximately is the gap that would be filled by my proposed CET scheme to match the current market average prices. So no, nuclear electricity is not that cheap yet, sadly. We could, in theory, overbuild on nuclear and do it all that way. Australia has a very “peaky” electricity demand so there would be a lot of nuclear sitting pretty quietly a lot of the time, unless a huge new amount of overnight demand, in particular, eventuated. Given the high capital cost of nuclear, that’s probably not going to be the way things would go. Wind is cheaper and can be added quickly in small increments. PV is popular and with some home storage could provide a really important service of meeting peak demand with clean energy. Then a little bit of gas provides very high flexibility at minimal capital or greenhouse penalty. So overall, I’m confident that at least for the next generation of electricity, a smart blend of these sources will prove the quickest and cheapest path to decarbonisation. Thanks for your reply. Starting to make sense to me now. Quick semantics question: When you say “$120 MWh” – do you mean the retail price (with margin) delivered to the user or the cost (no margin) at the power plant? If you mean at the plant – then when and if the “next generation” nuclear reactor being developed by Terrestrial Energy is able to provide LCOE power at $40 MWh (http://terrestrialenergy.com/corporate/ – first line under New Paradigm Civilian Nuclear Power) then would Michael’s confusion and question be completely legitimate? Also, if any of this reliable, quality, and high temperature excess heat during non-peak periods was able to be used for industrial heat, ammonia manufacturing (http://nhthree.com/NHThree-deck2.html – pg.14), desalination, etc. – it seems his question is ever more rationale. Cost, no margin, at the power plant, AKA levelised cost of electricity LCOE. And yes, at that price the suggested scenario makes a heck of a lot of sense. That price for clean energy would change everything about the way we design our systems and use electricity. I agree. I would be great to place the modular units near the demand (minimal transmission cost) and generate ammonia synthetic fuel ($2.50/US gallon diesel equivalent) on excess heat and desalinate water with waste heat. I wonder if the energy industry will tolerate the new competition even if TEI is successful. I am not sure that a relatively small Canadian company is going to be allowed to disrupt an annual $7 trillion industry to any significant extent. Who knows – maybe Lockheed will come out with a fusion reactor that will be even better yet. I wish both of them the best. and assumes both carbon tax and none, The treatment of renewable energy certificate subsidies (LGC) is not clear, currently worth about $40 per Mwh. I presume there is an escalation factor in the gas price. Thus in Figure 9 for NSW in 2020 small nuclear (SMR) is expected to cost about $125-$175 per Mwh. Onshore wind is expected to cost about $80-$130. It omits the elephant in the room of already built Victorian brown coal plant paying no carbon tax being able to sell perhaps as low as $30 per Mwh. Until those plants need rebuilding or there are CO2 penalties they are sitting pretty. What is the home energy storage you mention a few times in the article? I’m not aware of any cheap technology for doing that. This post hasn’t turned out to be as bad as I was expecting, with a good presentation and consideration of renewables in Australia. To put it another way; maybe we will end up with heaps too much wind in South Australia some times and the price of electricity out of South Australia drops to near zero. The argument in the post above stops right there. Yet what will actually happen is businesses will try and use that cheap power, or seek ways to store it, like in the Snowy system. Excess supply is no bad thing, particularly when demand is flexible enough to make the most of it. And I contend this will happen more and more as control and communication technologies improve. Incentives for quantity provided? Isn’t that what the market is? More electricity equals more money. or do you want a bureaucrat to say “congratulations your plant made a lot of electricity here is a bonus payment for making electricity”? That’s a worry. Worse though are capacity payments. This amounts to massive payments for dispatchable plant that hardly ever generates, like gas turbines. Capacity payments are a disaster because the market already accounts for that service. In the current system, when extra capacity IS NEEDED the price rises and they come on. They get paid for offering that reliability service through higher prices. They don’t need another payment for building the plant and never using it. This is what the RET is. Payments per MWh provided. Recall, this is about policy for transitioning from what we have to what we want. All I have proposed there is continuation of how the RET currently works. It’s not an “incentive”. It’s the bridging cost for bringing clean energy into this market, and the price has been set by wind power, which is cheapest. “Capacity payments are a disaster because the market already accounts for that service.” Not from clean energy it doesn’t, as evidenced by the fact the RET has been met exclusively by wind. Not one solar thermal with storage plant has got up under the RET, despite providing arguably a superior service to the network with dispatchability. Unless a market policy rewards firm capacity, we won’t get any dispatchable clean energy being built. We will just get wind, which will top itself out. I almost wasn’t going to reply because this sentiment is more or less my goal, and I’m glad to read it. Critical, rapid decarbonisation aside, forcing future electricity vendors to invest in nuclear reactors makes me cringe a little, not because I don’t believe there’s an important role for government, but because I suspect such a dictatorial approach wouldn’t work. Put that critical need back on the table, as close to the middle as possible, and the potential of nuclear for meeting future demand is obviously higher. Even with the sort of managed demand you refer to, I think, because we have to be upfront about how much there is to manage. http://energy.anero.id.au/2014/october/29 Roughly 1/24th at a fairly normal peak of demand yesterday was renewables, including hydro. How much of the rest can be managed? I would hope a noticeable chunk. I won’t speculate here where such savings can come from, but from my experience it won’t be from industry except for closures. In as far as closures can be blamed on unsustainable input prices (not always primarily electricity) what Australian industry doesn’t need is further uncertainty in quality of supply. Electricity supply is classically treated as certain, and so domestic or foreign owners tend to run plant as efficiently as possible but as constantly as possible. In my case, the plant’s power supply contract granted a cheaper rate over night so the heat intensive processes were scheduled then, but the week-long process for each batch of product had to run to schedule – primarily dependent on no prolonged power interuptions – or everything was thrown off. So there’s the efficiency and the required supply, forming a cycle. Foreign investment begat substantial upgrades (to 1970s-1980s plant) for the sake of efficiency, and interstate, the construction of brand new plant designed around cutting edge modern efficiency standards. None of this was rewarded by government, but only in anticipated power savings over time, assuming the plants were run like usual, i.e. constantly. That’s not even including the things we all think the future needs like majority EV fleet with necessary on-demand charging, large scale desal for water security, and then off-the-wall stuff like bidets in every house so we can cut back on paper use. That’s demand destruction destruction. Another thing, too, is I think a lot of academics don’t appreciate that when demand destruction means plant closures, it means unemployment, family stress and break-ups, impacts on kids, etc. etc. And when that appears to mainly be to avoid treating nuclear as just another energy source, it’s sad. True time-of-use retail pricing might fix the capacity problem though it could be unfair to some. Take the case of heavy air conditioner use in the late afternoon of a hot day when PV declines. Assuming no energy storage the open cycle gas plants would have to fire up. Suppose the TOU retail power price went to $1 per kwh. An aircon with 2.5 kw input power would cost $2.50 an hour to run. The peaking plant operators could make enough on the wholesale price to cover idle times. The high retail power price might reduce demand, the losers being pensioners in older style homes. Given that wind and nuclear often overlap, how can it be cost effective to double generate so much of the time. For example, in the spring and fall when demand is low and wind is high, we still need to run nuclear power in order to keep it economical. Similarly at night, wind tends to blow harder and faster and we still need to run nuclear because the costs of ramping up and down along with the fixed costs dominate the costs of nuclear. What little fuel is saved really is of little consequence. Wind builders will not build without the right of way so that operators must choose to pay wind first and also must be paid when the wind is not needed. Batteries and load shifting have not worked to make these work in tandem. In Ontario, costs from exports and curtailment have been very high. How do you justify the added expenses from the overlap? This post has generated such good questions. It’s a much happier picture for all concerned if we can boost overnight demand, which is why I am keen to marry this vision with electric vehicles. You are right: you describe a situation with cost we would rather avoid. Another such situation would be overbuilt nuclear: that should be avoided too. Australia may do slightly better out of high-penetration wind because our National Electricity Market is geographically huge and serves nearly double the population of Ontario. However, what is critical in the above post are concepts like “national interest” and “net-benefit”. These things need to be assessed on a continuous basis, and a differentiated clean energy target would, I hope, provide the flexibility to respond. If the wind is showing itself to be strongly correlated in supply and making it economically difficult to built nuclear which is needed, then national interest and net-benefit are eroding, and the drivers for further wind investment must be curtailed. Best possible outcome would be very cheap and infinitely flexible nuclear. We don’t have that yet. Excellent question, it’s the type of issue that needs to be managed moving forward. I think if we had very cheap nuclear you would want all of the power to be nuclear so that none of the other plants would have to fill in the gaps for wind. Flexibility can be added to nuclear at a cost (and a waste of energy) with steam bypass like is done in Ontario. But, does the amount of wind you build limit how much you can economically decarbonize? For instance, if you build X amount of wind and then legalize nuclear, how will you cut back the wind that is competing with nuclear if you already have too much? If you look at your ideal goal mix of generation how do you get there from here if you already have more wind than the ideal goal? ” think if we had very cheap nuclear you would want all of the power to be nuclear so that none of the other plants would have to fill in the gaps for wind.” Agreed. “But, does the amount of wind you build limit how much you can economically decarbonize?”. I have no doubt there is the ability to get that wrong and have an outcome that is not optimal!!! I would like to get the nuclear planning in place ASAP to head off these types of outcomes and get the most optimal mix possible. I’m confident Australia has less-than-optimal wind at only 4 % of our National Electricity Market. However I would rather not delay on the nuclear. One quasi-positive is that wind turbines are relatively short lived. If mistakes are made with wind, we are not stuck with them for long in energy-infrastructure terms. Who knows? There may be no second generation of wind turbines in Australia’s if nuclear superiority is clearly demonstrated. Fact remains, wind has been rapidly and successfully rolled out with a good decarbonisation outcomes to date, it’s cheap and incremental which makes investment easier, and we can use it to decarbonise further during the unavoidable wait for nuclear. Many nuclear plants are on the edge of profitability. Vermont Yankee and other plants have closed on concerns about profits. How can you attract more investment into a risky regulatory market if there is a source of power with advantages over nuclear like right of way that will be paid for at times of nuclear’s weakness and low market prices? Isn’t it true that wind and nuclear compete and wind can undercut nuclear in the times it produces? What will make nuclear attractive for Australia? A CET of 95% that rewards firm capacity and is continuously monitored for net benefit and national interest in reaching that target. Under that target a floor of about 60 % of Australia’s electricity would go nuclear. Under those conditions if nuclear struggles, it’s nuclear that needs to think harder. I’m from EU and this is not true for EU. Winter demand is roughly 2x summer demand. If you overbuild nuclear 2x then your capacity factor drops and your costs go through the roof. In the case of France: they have 63GW of nuclear and peak demand 100GW (in winter cold snaps). They have capacity factor 75% (because of load following), which low for nuclear. If they build 100GW to cover peak demand then capacity factor would drop to 55%, which would be a disastrous for economics. Indeed. And the key word you may have overlooked there is “cheap”. which shows in Figure 2-2 that 52% of SA electricity was generated by burning gas. The pipeline map in Figure 2-4 shows how gas will be diverted to the LNG export plants nearing completion in Gladstone Qld. Last year the east Australian wholesale spot price for gas was about $4 a GJ some think it will be $8 this time next year perhaps rising to $12. Oddly a sister organisation AEMC has a report predicting lower electricity prices in SA. Gladstone is expected to consume two thirds of east Australian gas production be it conventional, fracked shale or coal seam. Almost certainly SA will import more brown coal fired electricity from Victoria with about three times the CO2 per Mwh of combined cycle gas. Ditto Tasmania with lower hydro dams expected in 2015. Brown coal will be out of sight out of mind until they need to replace the Latrobe Valley power stations circa 2030. Fabulous piece, and thanks very much. Another little detail insufficiently considered: you point out that solar output peaks do not correspond to demand peaks, but that is very easy to remedy. Subhourly demand data, ideally in the form of subhourly wholesale prices, would allow any competent astronomer to determine the ideal direction to aim a fixed solar panel for greatest wholesale revenue. In other words, solar panels could be (and should be) oriented to maximize revenue, not energy. That isn’t being done now because retail electricity rates are time-independent. But utility-scale installations shouldn’t be so hidebound. In fact, existing PV farms could be re-oriented right now, to take advantage of such differences. Great example of the type of thinking we require. Rather than asking “How do we use more PV?” we need to ask “How do we use PV most effectively?”. That may well mean west-facing systems deliver greatest net-benefit from a systems perspective. This should be considered. Nice one. I just watched SA Premier Jay Weatherill on TV and I wonder if he has left the door open to nuclear. He repeated the 50% renewables objective by 2025 made months ago e.g. One possibility is if SA manufacturing shrinks the present mix may suffice. That’s 540 MW of PV and 1450 MW of nameplate wind power with a coal plant and several gas plants. The ~$40/Mwh REC subsidy needs to continue to expand renewables. 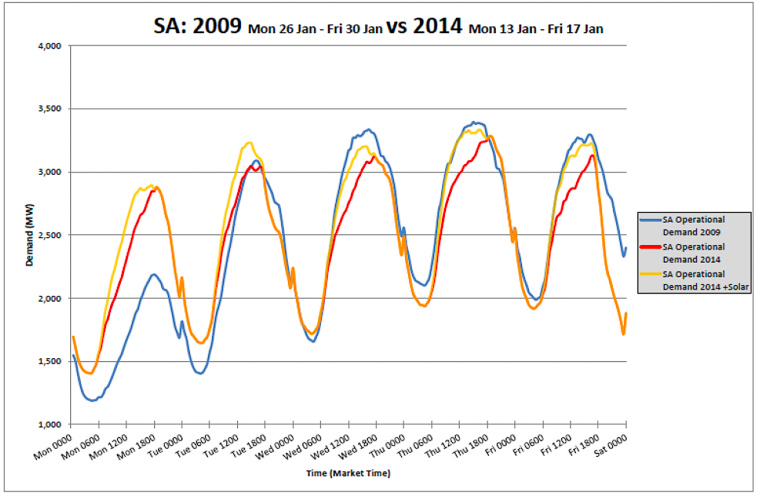 SA summer peak demand appears to be about 3500 MW which may linger on with a static population with many retirees. That aside if 50% renewables were to be achieved without backup from double priced gas or imports of dirty brown coal power then some of form of flexible generation is needed. It seems we may not have SMRs by 2025 but we there is still 11 years to build an EC6. There were seven fission detonations or dirty bomb experiments, including balloon launched. Some fissile material originated in SA from Radium Hill near the NSW border and a small deposit at Myponga near Adelaide. However within a decade or two uranium was discovered in or near the Woomera Prohibited Area. Olympic Dam the world’s largest uranium deposit is just outside the WPA but Prominent Hill with copper and gold but subeconomic uranium grades is inside. Other new mines could go ahead but they need power and water. Senator Xenophon was at the ceremony but hasn’t shown his cards on nuclear for SA but is known to oppose renewables subsidies. I’m disappointed Sen X wants international offsets (recently 50c each and probably dodgy) to mop up the likely shortfall from Direct Action if it ever gets off the ground. The other point about Maralinga and uranium mines is that SA is not a nuclear virgin. Just needs to do the middle parts of the fuel cycle like enrichment and power generation. And the winner is … coal. Just watched ABC Landline (no transcript) that showed a farmer getting cash for carbon credits on half his property so he could run more cattle on the other half. It seems actually shutting down coal fired power stations is now almost irrelevant with the latest green thinking. I live down the road from a hydro dam that was overflowing a few months ago. Now coming into summer it is just 23% full. See image here.. That electricity shortfall will be made up importing coal power through the underwater Basslink HVDC cable. Yet a few kilometres away a static display says the main aim of the cable is to export power, not import. Questionable carbon credits, reduced clean power. Why aren’t true greenies up in arms? “shutting down coal fired power stations is now almost irrelevant with the latest green thinking”. Green thinking is efficiency and renewables. It closed ANOTHER coal plant last week. That’s about 6 now and there are still about 9GW of excess capacity according to AEMO. Coal is getting closed by renewables right now, and even with the most wishful thinking it is ten years before nuclear has any impact in the market. Nuclear has a lot of catching up to do in Australia. And I predict it will never even make it out of the starting blocks. You could be right about nukes never getting a run but I think you are dead wrong about renewables displacing coal. Whatever small coal plant you refer to (Playford, Brix, Redbank, Anglesea) they’re little tackers compared to Hazelwood and Bayswater. Remember they closed Swanbank gas fired plant to re-open Tarong coal fired. I think even with an economic downturn it is on the cards Australia’s 2015 emissions will be nontrivially higher than in 2014. Reasons less hydro, RET uncertainty and the gas price shock after Gladstone LNG hub opens. The carbon farming scam is a big topic for another day. Somehow ore crushing plant can be powered by solar energy at 2 a.m. Aside from the carbon inconsistency he thinks there is more gas and oil in the ageing Cooper Basin. Santos say fracked gas from deep formations will be more expensive. A few years ago they wanted to pump CO2 from power stations in the NSW Hunter Valley to the Cooper’s empty gas reservoirs. I agree SA should go large on low carbon energy, metals mining and the associated desalination. The combination has to be feasible which is not in the way they presently envisage. Due to the influence of Atomic Insights, I am somewhat skeptical of renewables, so although I have no particular objection to the vision outlined here, I remain to be completely convinced. It is difficult to shake off the feeling that nuclear and renewables are awkward bedfellows, politically if not scientifically. I have the impression that championing renewables allows middle-class urban voters to avoid hard thinking on energy policy, with the result that concern for the environment doesn’t really translate into significant action. Many people (including the Greens) seem to believe renewables can do it all, which just leads to the progressive Left pushing against the Right for more solar and wind. This is how the debate plays out in the media, while the real issues are not addressed and carbon emissions change only little. I wish I could find the article but recently in Ontario there has been wind farm oversupply and unsustainable low prices paid by neighbouring states. CANDUs like at Bruce have been wastefully curtailed without receiving any compensation. Wind gets priority even through it abates nuclear or hydro – and more wind farms are being built! So there’s obviously some questionable planning happening there. In Australia, it would be different because VRE and nuclear would act in concert to mitigate coal. The integration issues can be tackled fairly as all techs are expanded (guided by focusing on rapid decarbonisation and the national interest). Our solar and wind resources *are* superior after all, and most of those windfarms will last for decades yet, so despite “mostly nuclear” being technically more straightforward, integration with what we have would still be the reality. Legally restricting the building of a given tech (no matter how relatively inferior) is unfair, and don’t we know it. @actinideage I was going to comment how a geiger counter shows a tube of Pt Pirie yellowcake emits 245 mSv a year but your website seems to be mostly closed to comments. Even without quotas that sunk cost should be utilised therefore any NP should either load follow or have a ready substitute load. Not a problem for SMRs like NuScale apparently. With the EC6 steam bypass is required I gather. Of course if they dynamited Hazelwood the Vics could get baseload from SA. Toyota reckons we’ll all be driving hydrogen cars so making that fuel could be another form of load shifting. 245!!! I can’t work out why you can’t comment – I’ll keep looking at settings. Yes, CANDU seems to be the right size and price-point for Australia’s needs, and the recently proposed design upgrades and fuel flexibility make it even more attractive. It’s tempting to focus on the peak demand and think roof top PV can knock the top off this. But that’s not the BIG problem. That’s just a sub problem and while I’m a great fan of “divide and conquer” when it comes to problems, this is a situation where it can, I think, give the wrong answer. The BIG problem is to replace ALL our fossil fuel use with one or more technologies and electricity looks like being a big part of that. So what does the demand curve look like when you are running damn near everything with electricity? I’m guessing those expensive central power plants will be running 24×7 and the summer air-con peaks won’t be peaks at all. From what I can see PV shifts the summertime peak for grid demand from about 2 pm to 5 pm or so, then it’s grid demand as usual. What proponents seem to want is a generous daytime feed-in tariff that helps pay for grid use at night. I wouldn’t run an aircon off a lithium battery in the early evening as it will be stuffed before long, the battery that is. Presumably most electric vehicle charging would be at night. The fossil fuel replacement problem is so vast we can’t rule out any approach yet nuclear critics do. The mine will stay underground not open cut but the workforce will double. A lower cost method of treating ore will be tried. Presumably the current 40 ML/d of groundwater from bores and the 132 kv transmission from Pt Augusta will be adequate or perhaps there are other plans afoot. A major reason given for the expansion apart from the gold and copper price holding up is increased uranium demand from China. If it helps displace coal in China that is some compensation for the antinuclear stance (see below) of the SA government. It was originally planned to get U3O8 production up to 19,000 tonnes per year. An old document from the parliamentary library suggests a tonne of original uranium (most of the weight of the oxide) saves 55,000 tCO2. I make that about a billion tonnes of emissions avoided per year. Good one SA. # Former premier Rann banned U-mining at Arkaroola while current premier Weatherill freely admits to being opposed to nuclear power.. The usual suspects want token renewables dwarfed by the fossil contribution. There is only a persistent problem. As the statistics in a.o. Denmark show, a variable renewable share of 25% will already bring situations in which those renewable produce near all electricity needed. As wind and solar have no variable costs, it is beneficial for them to continue full power even while the whole sale price is $1/MWh. So other generators have to curtail output deep (<20%). If wind stops and sun doesn't shine those other generators have to ramp up fast. But present safe nuclear (AP1000, EPR) is base-load. oversize the capacity of wind & solar. And install power-to-gas plants (those run already in Germany) which produce renewable natural gas. When wind and solar then fail gas turbines burning renewable gas can jump in. Sorry, I see that as the wrong model. Wind and solar should be able to stand by themselves. If they need help producing reliable power, they aren’t so cheap are they? Sanne? That’s Bas. You should probably ignore him, he is here to waste people’s time. Great article. However I have one big concern about renewables: storage … or rather the lack of it. You mentioned that Australian renewables is doing just fine thank you very much, But I have to ask; what makes up for RE fuel shortages? Hydro? Pumped storage? Gas plants? Coal plants? Whatever the answer, the key question is can that(those) storage mechanism(s) be scaled up to allow more RE? I doubt it but I expect you understand the Aussie situation much better than I. A followup question is just how much RE storage would be required. Hydro dam storage, typically a TWh per GW production, is needed to account for insufficient-rain periods. Wind is probably more reliable, solar, at least in the outback, even more so. What do the experts say in regards to storage needs? The policy, as outlined, would not facilitate renewable penetration beyond the point of net-benefit. A lot more penetration can be achieved at net-benefit without storage. If the storage is cost-effective then penetration may continue. If it isn’t, it wouldn’t. What makes up for lack of RE fuel? Under this model, the capacity of other generators. The point is to NOT push renewables beyond the point of sense. So how much storage? Determined by cost (and potential other planning and environmental factors). The point is that the policy is not deterministic, it’s open to the options. I’d like to see the claim that geothermal is effectively dead fleshed out a little. Both the AEMO study and the UNSDSN deep decarbonisation pathways studies predicted a very substantial role for geothermal in the future. Go back a few posts and download my recent paper, which has a lengthy section on geothermal. I would not say dead, however the way people thought it would be done it not the way it will happen it would seem.